Autumn Blaze Maple - Acer x Freemanii. 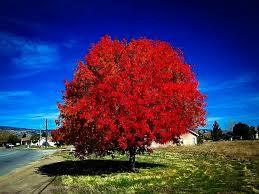 The Autumn Blaze Maple is a specially cultivated deciduous tree that is a cross between red and silver maples. 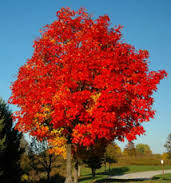 This produces unique, long-lasting fall foliage that spans between bright oranges and deep reds. Landscapers mostly use this tree for its coveted colors during this time of year. It complements large spaces well because of its natural oval canopy. Autumn Blaze Maples thrive in Hardiness Zones 3-8 and enjoy wet or dry soils with lower pH levels. This tree prefers full sun exposure for meeting its potential growth of up to 3 feet a year for an average mature height of 40-60 feet. Autumn maple blaze tree stands out among maples as having a bright red and orange color in the fall. Its luscious leaves are vibrant as well as comforting. With thick branches and growth that protects it from disease and insects, it has become highly desired and continues to grow in popularity among those in the United States and other countries. It has the adaptability and vivacity of the silver maple and the hardiness and resiliency of the red maple. In addition to its dazzling beauty, this tree is highly prized for its low-maintenance. You never have to rake up fallen twigs or seedlings. It does best when it can be grown in a wide range of soil conditions. It is effortless to grow and maintain as it takes no special care to become beautiful. 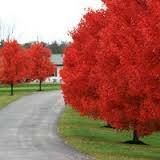 This trees do great when planted in climate zones three through eight and is also called Acer Rubrum. It is gorgeous and is great to provide lots of vibrant color during the fall and even supplies lots of shade during the spring and summer months. This tree is also spectacular to draw in small wildlife. The squirrels love to romp and play on the long branches of this tree, and it also brings in lots of birds. These trees are unusual and bring lots of curb appeal to all homes and lawns.